- In today's Real Estate Biznow, there is a snippet about the mayor's press conference last Friday at Nationals Park, where he touted the progress at development projects along the Anacostia River and the Washington Channel over the past year, including securing public financing for infrastructure improvements at the Southwest Waterfront, demolishing the old Waterside Mall to make way for Waterfront Station, and continued work on the environmental impact analysis for the new Frederick Douglass Memorial Bridge. - DCMud reports that PN Hoffman, one of the development partners responsible for the redevelopment of the SW Waterfront, may bring a Yes! Organic Market to the waterfront. A Yes! Organic Market recently opened at Union Row, another PN Hoffman project located just north of 14th & U Street, NW. 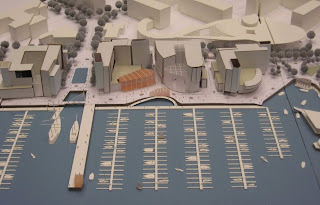 The scale model pictured above is the central portion of the new SW Waterfront, which is the first section of the waterfront that will be redeveloped. The tree-lined street on the left side of the photo is 7th Street. See my prior post from September which explains each phase of the redevelopment.